There are some days when Benji likes to take every pillow and cushion in the house and lay it on the living room floor. Then he and James proceed to to jump off every piece of furniture imaginable onto the pillows. Some days I don't mind but today I didn't want to have to deal with it because mommy usually has to put all the pillows back. Well today Benji assured me he would clean up if I let him play. Well I did and sure enough he cleaned up. 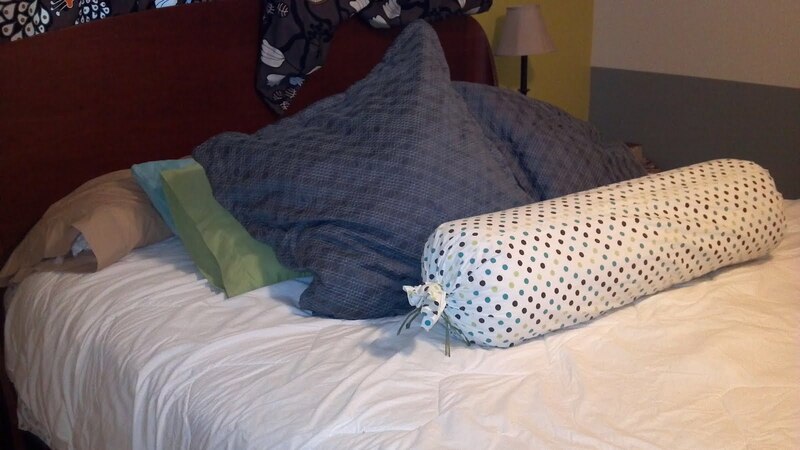 He even told me, "Mommy, I put the pillows back the way you liked them last time." (Everything is last time or last year, so cute) Anyway I didn't even think to check if he did a good job or not, but when I came in to fold clothes I noticed the pillows and how they were arranged the way I liked them last time. He took up 3/4 of the bed with my pillows but he did a pretty decent job, which was a pleasant surprise.